This "Historically Speaking" column appeared in the Exeter News-Letter on Friday, December 16, 2016. Still waiting to mail your packages in time for the holidays? 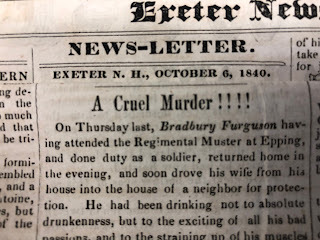 Even if you don’t quite make it, rest assured that the mail is much more efficient today than it was in the 19th century. Before 1900, mail wasn’t delivered to your door – it had to be picked up at the post office. Nearly every month the post office would publish a list of letters that hadn’t been claimed. Packages sent by US Postal Service had to weigh less than 4 pounds and even this was somewhat expensive – averaging 1 cent per ounce. But great changes would come as the nation’s railroad system sped up the system. Home delivery was certainly a convenience for people, but letters and small packages weren’t the only things traveling across country. 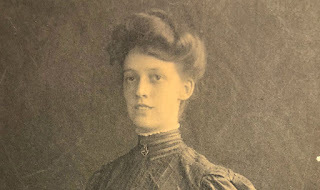 The two powerhouse mail-order businesses from Chicago – Montgomery Ward and Sears, Roebuck & Company – had been doing a bang-up job of supplying goods all across the country for decades. By 1900, both companies were still struggling with the problem of shipping goods to the public. There were several options available to customers. A private express service, like American Express or Wells Fargo, would ship directly from Chicago to your hometown. These were efficient if there was an express office in your town. If there wasn’t, you might have to travel several towns away to pick up your goods. Sears advised, “If you live at a great distance from the express office, it might be more convenient to send an order by mail in two or more packages, each weighing four pounds.” At least your smaller packages would reach your local post office. This, of course, was impractical if you ordered anything over four pounds. If the order weighed more than 20 pounds it could be sent as freight by rail. To really play the shipping system, Sears reminded, “Railroad companies usually charge no more for 100 pounds than they do for 20 pounds. It would be a considerable saving of money if you could make up a larger order, either of your own wants or club together with your neighbors, as the freight charges will amount to comparatively very little more.” That way, if you only wanted to order a B flat alto ocarina for 29 cents, you could save on shipping if you combined it with your neighbor’s order of 25 pounds of flour. Clever. The U.S. Postal Service website tells us, “The year Parcel Post began, Sears handled five times as many orders as it did the year before. Five years later, Sears doubled its revenues.” The original weight limit of 11 pounds was quickly raised. Parcels from the Exeter office included, a can of milk, pumpkins, an umbrella and a “chine of pork” – a tasty dish of stuffed salt pork. An interesting loop hole in the parcel post regulations was the lack of any limits on what could be shipped. Thus, there are several accounts of parents who shipped their babies and children by parcel post because it was cheaper than buying a railroad ticket. As funny as these stories are, it wasn’t a widespread practice. These were often stunts and the children were usually entrusted to friendly railroad conductors or were accompanied by a fare-paying adult. Local postmasters frequently reminded the public that, in spite of what they may have heard, they do not ship children via Parcel Post. 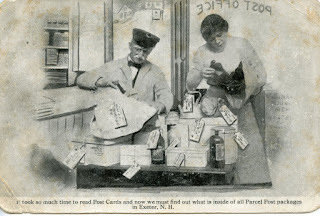 Photo: “It took so much time to read Post Cards and now we must find out what is inside of all Parcel Post packages in Exeter, NH” mutter the exasperated postal clerks on this novelty post card produced by the Frank Swallow Post Card Company in Exeter, NH.